Sensational, inspirational, celebrational… pretty good. It's been over a decade since the Muppets last graced the big screen, yet Kermit, Fozzie and the gang are still remembered with fond reverence by grown-up fans of The Muppet Show , The Muppet Movie or any of their other filmic outings. It’s not the grown-ups, however, that this film needs to impress if it’s to be considered a success. Will under-10s look at the Muppets and see just a bunch of lame, low-tech puppets? Rising to the challenge is Jason Segel. The man who shoehorned a puppet musical into the climactic scene of Forgetting Sarah Marshall. Segel’s well-documented Muppet mania was the catalyst that got this movie into production, seven years after Disney acquired the rights from The Jim Henson Company. 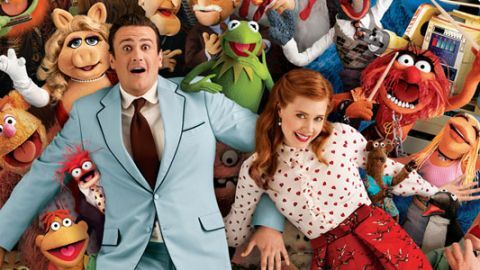 He co-wrote the script with Nicholas Stoller and co-stars as Gary, an ordinary guy from Smalltown who takes his fiancée Mary (Amy Adams, adorable) and younger brother Walter (a 3ft chap who happens to be made out of orange felt) on an exciting trip to The Muppet Studios in Hollywood. When Walter discovers his heroes have disbanded and an evil billionaire named Tex Richman (Chris Cooper) is planning to take over the Muppets Theatre, he realises the only way to save them is to get the old gang back together and put on a fundraiser. Thus swings into motion a textbook on-with-the-show musical comedy, celebrating the virtues of teamwork, being kind to each other and impromptu song-and-dance numbers – the kind of thing the Muppets do best. This update’s great strength is that it marries classic Muppet antics with the most Muppety aspects of modern culture. You couldn’t find two more apt human sidekicks than duo Segel and Adams, while bringing Flight Of The Conchords ’ Bret McKenzie in to write the songs is inspired. Perhaps there are one too many hip celebrity cameos (Dave Grohl, Zak Galifianakis, Kirsten Schaal, Leslie Feist…). But those who accuse the movie of pandering too much to thirtysomething nostalgia-hounds forget that the Muppets always were about bad puns, fourth-wall-breaking gags and broaching the silly-sophisticated divide between adult and kid humour. In an age when the R-rated comedy has become mainstream, that’s rare enough to be refreshing. Fox News may call them commies; to the rest of us, the Muppets are just plain, loveable and nice.